So far, this has been an extremely positive experience here in Stuart, Florida. I've met tons of really nice people, and even a few questionable people....but they were the minority, for sure. Once I'm finished with this project, I plan on mentioning all those I can remember...which will be a challenge, to be sure. Anyway, the Stuart News sent a photographer over to shoot some photos of what I've been 'up to' , pun intended. So a couple weeks ago, Matt the photographer (Matthew Ratajczak) Showed up shortly after 8 am. I'm not sure he knew what he was in for given that I had been currently painting on the East side of the building and that by 8 am, it's already extremely hot up there. I'm pleased to announce that we both survived....soaking wet, but we survived. "Double Take Reveals Murals Not Real"
I think that it's a sort of shortened version of the original article. Don't forget to view the slide show, which was a really nice touch. So he asked me where I did my research and did I know that they had murdered three police officers near Miami. I didn't know that, I responded. He wondered if it was a good idea to 'glorify', in his words, a group of murderous thugs. I responded that I wasn't exactly doing that and that it was part of Stuart's history. I also asked him if he knew that after the gang had robbed the Stuart Bank, they were arrested and later allowed to escape by the sheriff . At least, that's something I read online. He shrugged and mumbled something while walking off into the sunset. Later the next week, the very same guy wrote a letter to the editor of the Stuart News asking the same thing. So I did some research and found some interesting information. Also, I received an email from the city that said...."any artwork that portrays local lore or history in the community whether it is good or bad; it is still colorful and unique to us. Having said that stay the course we are behind you all the way." I should mention that the Lyric Theater here in Stuart has bronze stars embedded in the sidewalk at the entrance to the theater, including one for the Ashley Gang. Down the street is the Ashley Restaurant that is full of Ashley Gang memorabilia and I also found out that there was a movie made about them called "Little Laura and Big John". 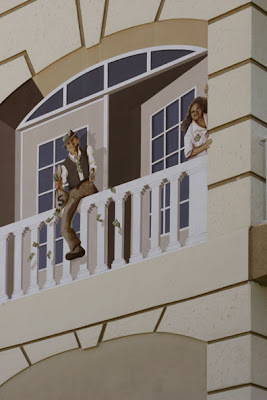 The photo above shows the Ashley Gang mural in progress....I have a lot of small changes, mostly with the shadows, but there will be two more characters and more money floating down. 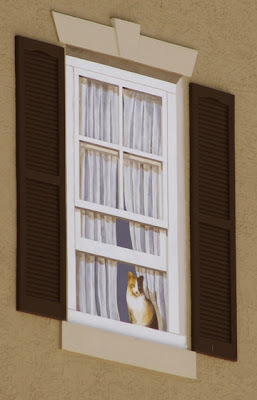 In the next window is Mark, job supervisor, keeping an eye on everything. Mark's an all around nice guy and has been really helpful since I've been here in Stuart. I suppose that a set of plans he's holding, held together by my red string, of course. The young in the photo hanging on the wall is Mark's son. 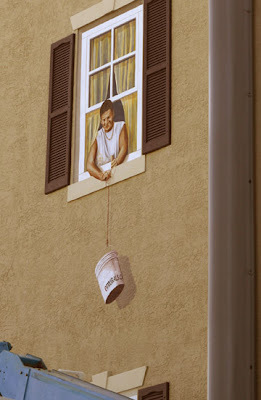 And last, but not least, is Patrick the painter, lowering a bucket of paint to his comrades, who you will meet later. That blue thing at the bottom is part of the lift and the vertical gray bar on the right is the plastic wire-guard on the cement electric pole. It's really tight back in this corner. Anyway, Mr. Boxter jumped out of his cool little car, arms still waving while marching across the street, all the while yelling at me...I couldn't tell what his was saying though, and I didn't think it was nice that he didn't wait for the young lady that accompanied him....I think it was his grand daughter. The lift you see here has been moved around back to Seminole Ave. and now every one's happy but me. I had to squeeze it into a narrow space right next to a large electric pole. Seems OK, so far. Oh...the murals.....right. So as I promised in my previous installment, I've added something to the end of our brave fisherman's line.....and of course, it's a Sailfish. Also in that panel is a replica of a letter the Stuart Chamber of Commerce used to send to companies thinking of moving here. 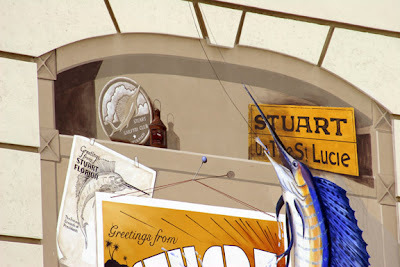 The yellow sign, which probably really wasn't yellow, is based on an old Stuart sign and that round think is a replica of the Stuart Sailfish Club's old logo. They've been around here forever and I thought it would be appropriate that they be represented. The postcard the fish is jumping out of is my design....I'll be adding another lamp like the one you see as well as some netting...somewhere. As for those windows to the right....I'll save those photos for later. I added some interesting characters this time. Oh....regarding those characters. A brief explanation. 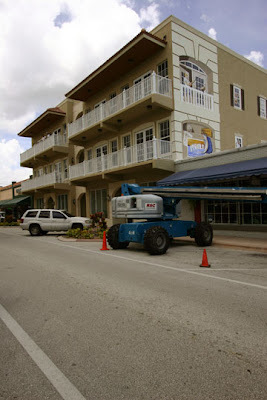 The four corners of the building are intended to be the focal point, if you will, and therefore, I've saved those four areas for the historical representations, which are, Chief Osceola, Frances Langford, Sailfishing in Stuart and still to be painted, the dreaded Ashely Gang. The fourteen small windows are sort of secondary and are not intended to have any historical significance. 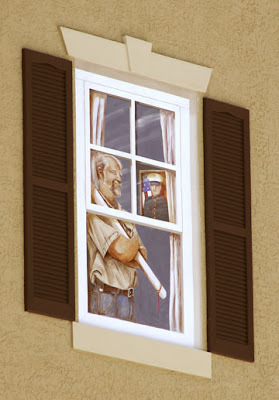 I've used the windows to attract attention by adding figures.....people.....some in action more than others. And it so happens that for most of the windows, I used live models and some happened to be working on the site while I was there. 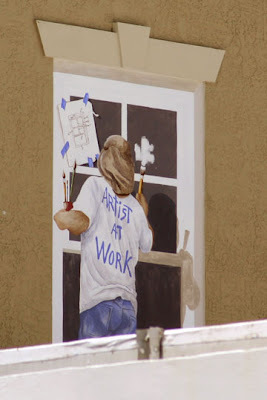 More about the windows in my next installment....soon.